On Monday, the New York Times reported about the listing of an Upper West Side house at 24 West 71st Street – “a historically significant granite-and-iron-spot-brick townhouse with fanciful terra-cotta embellishments and distinctive interior millwork.” The stately residence sold for $4.3 million back in 1996, setting a record for the neighborhood. 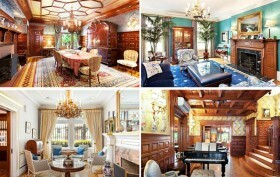 Now, 20 years later, it’s back and is looking to reclaim its title of most expensive townhouse sale on the UWS. The home is asking $29 million, more than the current record holder 247 Central Park West, which sold for $25 million earlier this year. The 7,134-square-foot house was built in 1892 by architects Lamb and Rich, and it underwent a $1 million renovation in 1988 that turned it from a ten-unit apartment building back to a single-family mansion, surely helping seal the record-breaking sale in ’96 to current owners Arrien and Robin Schiltkamp. According to the just-launched listing, “Immaculately maintained, the six-bedroom, six and a half-bath townhouse has retained the gorgeous original details that infuse every corner, while augmenting them with opulence by Jonathan Rosen Interiors.” Some enviable features of the home include six bedrooms; an elevator; a private, south-facing back garden; top-floor terrace; almost all of the original woodwork; stained glass windows; a 400-pound original door; ten gas fireplaces; and a Japanese-inspired spa.